Since September 30, the Russian aviation group in Syria has destroyed 1,200 fuel trucks carrying illegal oil, the Russian General Staff said Tuesday. “Since the start of the air campaign, Russian aircraft have destroyed over 1,200 such trucks,” Lt. Gen. Sergey Rudskoy, chief of the Main Operational Directorate of the General Staff of the Russian Armed Forces, said in a statement. “The Russian airstrikes continue to focus on destroying sources of illegal revenue for terrorists in Syria,” Rudskoy stressed. According to him, six illegal oilfields controlled by terrorists, as well as seven columns of fuel trucks carrying oil products have been destroyed over the past three days. 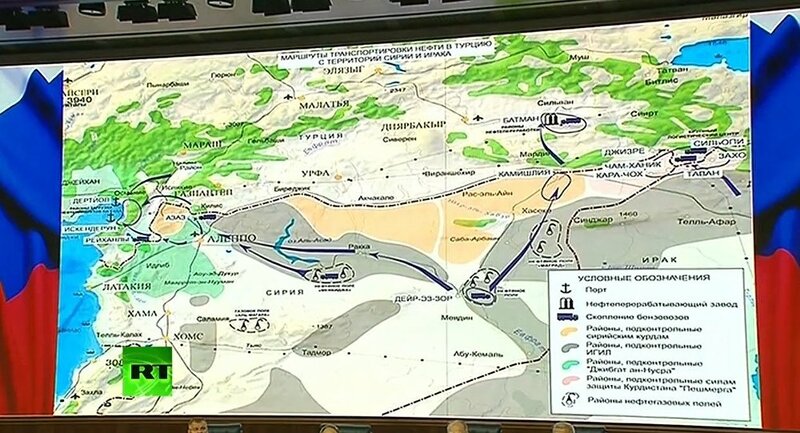 Earlier in December, the Russian Defense Ministry provided satellite images of oil trucks massing at the Turkish-Syrian border as evidence of illegal oil smuggling from Syria into Turkey.Deputy Defense Minister Anatoly Antonov accused Turkish President Recep Tayyip Erdogan and his family of direct involvement in an illicit oil trade carried out by Daesh. Turkish President Recep Tayyip Erdogan and his family members are directly involved in illegal oil deliveries from Daesh oil fields in Syria, according to Russia’s Defense Ministry. Turkish President Recep Tayyip Erdogan and his relatives are directly involved in trading illegal oil which belongs to Daesh (also known as the Islamic State), according to Russia’s Defense Ministry. “Revenues from the sale of oil are one of the most important sources of activity by terrorists in Syria. They earn around $2 billion annually, spending these funds on hiring militants from around the world and equipping them with weapons, equipment, and arms,” Russian Deputy Defense Minister Anatoly Antonov said during a briefing in Moscow. The ministry provided photographs of columns of oil fuel tankers on the Turkish-Syrian border. Fuel tankers with oil freely cross the border between Turkey and Iraq, according to Russia’s General Staff. “The main consumer of this oil stolen from the legal owners in Syria and Iraq is Turkey. According to available information, this illegal business includes the upper political leadership of the country, President Erdogan and his family,” Antonov added. These oil revenues are used not only to enrich the Turkish leadership but to arm terrorists as well, the General Staff stated.Oil from Daesh-controlled areas in Syria is shipped to refineries in third countries after being transported to Turkey, the head of the Russian General Staff’s operative command said Wednesday. “Space reconnaissance has reliably showed that after crossing the border, tank trucks carrying oil head to the ports of Dortyol and Iskenderun,” Lt. Gen. Sergei Rudskoy told reporters. Russian deputy defense minister said that Russia will continue to provide facts that Turkey steals from its neighbors, adding that it’s a surprise no one in the West ever noticed that Erdogan’s son is the owner of one of the largest energy companies, while the president’s son-in-law was appointed energy minister. Russian Defense Ministry’s information on Daesh oil trade will be published online. Moscow calls on Ankara to provide access to places where, according to Russian data, Daesh oil trade centers are located, Antonov said. “I am certain that there will be claims that everything you’ve seen here now is false. Well, if there are no such things, they [Turkey] should grant access to the places we showed journalists today,” Antonov said after presenting satellite data and photos said to prove Turkey’s involvement in illegal Daesh oil trade. The group is designated a terrorist organization by numerous countries, including Russia and Turkey itself.